If you want to increase the current charging your battery in a 12V circuit to decrease the charge time of the battery, you might want to wire your solar panels in parallel. The first way is to simply connect both of the positive terminals of the solar panels to the positive input of the regulator and similarly for the negative terminals. If the regulator has screw terminals, then you may need to cut the plastic insulation to fit the bare cable in and connect. The second way is to purchase a solar branch connector. This is used to join the now standard MC4 connectors that are connected to all off-grid solar panels. Simply plug both of the positive MC4 terminals from the two solar panels into one connector and both negative MC4 terminals into the other. 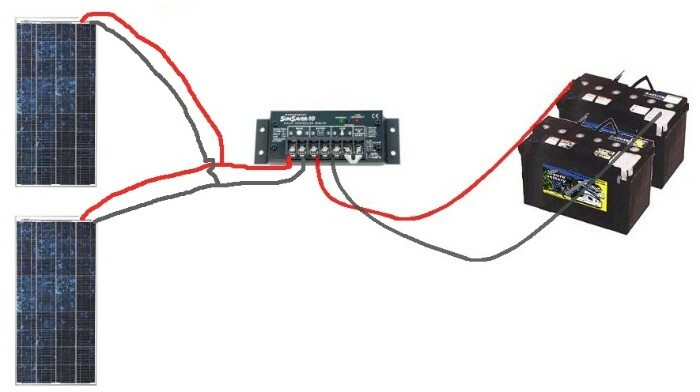 You can then wire two separate cables into your controller, instead of four. The extra solar cable with MC4 connections on one side only, and the double cable entry gland for a waterproof entry may be useful. The final way you can achieve the same outcome to increase your charging current for a 12V battery system, is to purchase an MPPT controller. You can find out more about this in our article about choosing the correct controller.